We kick off 2013 with a look at something that has had a profound influence on both myself and Ralph, although we did not acquire it till more recently, I speak of Transformers: Continued Generation 2, published by TMUK (Transmasters UK), specifically Issue 18, or the fifth TMUK issue, from the Space Year 1995. This issue kindly given to me by the Fanzine’s editor and wonderful chap, Matt Dallas. We then move on another massive franchise and an aspect of it that has been cruelly overlooked in years and we speak of J.R.R. Tolkien’s The Hobbit and The Lord of the Rings. Overlooked?! I hear you say – I refer to the BBC Radio versions of both, with The Hobbit being originally produced in 1968, and The Lord of the Rings in 1982. Two adaptations that don’t have the recognition or popularity that both deserve, especially LOTR, as the late Michael Hordern gives us the definitive portrayal of Gandalf. 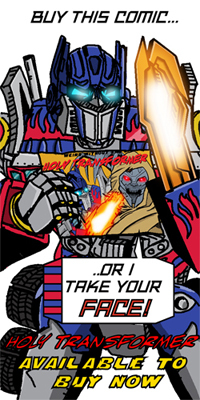 Transformers Galaxy – older TMUK site, some artwork and info still available.